Share "Tips for Making it a Better Winter for Wildlife"
Winter is just around the corner, and that means deer, elk, game birds, squirrels, chipmunks and wild birds are shifting into survival mode. Because it’s a time of particular stress for wildlife, it also happens to be a time when your actions can have a tremendous impact. Here are a few steps you can take to ensure the survival of wildlife in your area and even attract them to your property. 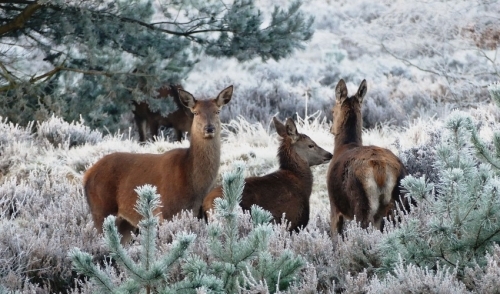 At this time of year, energy sources for wildlife are starting to dwindle. High quality forage is in short supply. Deer and elk are heading into breeding season, a period of low metabolism and reduced appetite. During the rut, a buck may spend only 20 to 30 minutes per day eating. Burned calories during the rut will greatly deplete body nutrient stores. The lack of nutrition will be evident in poor antler growth, lower reproductive performance, insufficient milk production and deficient fawn development. A good source of supplemental energy for deer and elk is Purina Mills® Premium Deer Block. This highly palatable, easy-to-use, 20-pound supplement attracts deer and provides more balanced nutrition than whole grains alone. For the more serious deer enthusiast, consider starting a supplemental feeding program using Purina Mills® AntlerMax® Deer Blend as a complement to native forage. Place Deer Blend in a timed feeder or scatter by hand on or near a game trail near high animal activity and close to a constant supply of fresh, clean water. The strong apple flavor will attract deer and entice them to eat a more balanced diet. Another way to supplement a natural forage diet is with a mix of corn and Purina Mills® WaterShield™ Deer 20 pellets in a timed feeder or AntlerMax® Deer 20 in a self-feeder or trough. Although pellets provide more balanced nutrition than corn, deer don’t always recognize pellets as food, so this regimen can be a good way to introduce them to this healthier diet. For more information about how to start a supplemental deer feeding program, visit our site. For wildlife and game birds, a good source of energy is Purina Mills® Premium Wildlife Block. This 20-pound block supplement is easy to use and a tasty, nutrient-dense way to attract wild birds, rabbits, game birds, chipmunks and squirrels to your property. Because it provides more balanced nutrition than whole grains alone, it’s especially beneficial during the most stressful time of year for wildlife. Fresh, clean water is essential to the health of every type of wildlife. One of the best ways to attract wildlife to your property and ensure survival is to offer a dependable, convenient supply of fresh, clean water (in winter, that means a water supply that is free of ice). Because it’s such a simple, obvious concept, it’s an easy one to overlook, but it works. Another way to attract wildlife is by fall and winter disking. This will encourage forb (weed) growth, which benefits all forms of wildlife. Planting food plots is another way to improve nutrition for deer and turkeys. Winter food plots are usually planted in September or October. In addition to being great attractants, they impact body weight and condition, breeding success and possibly even winter survival. Winter food plots include the more familiar small grains such as wheat, oats and sometimes ryegrass. Winter peas, turnips, typhon and adapted clovers are also good options for planting in the fall. To learn more about which plants to sow, and when to sow them, check with your local Purina Dealer, Tecomate Seed Co. or your local State Extension Service. By following these tips, you can make winter more tolerable for wildlife and more rewarding for you. Patented AntlerMax® Technology promotes optimal antler growth by improving protein quality. The unique digestive tract of deer reduces the quality of most proteins by breaking them down too quickly and diluting their value for antler growth. AntlerMax® Technology protects high-quality proteins from early breakdown and delivers a higher concentration to the growing antlers. AntlerMax® Mineral Technology provides a power-packed nutritional package with proprietary levels and ratios of essential vitamins and minerals to help promote optimal antler growth, density and strength, fawn health and reproductive performance. 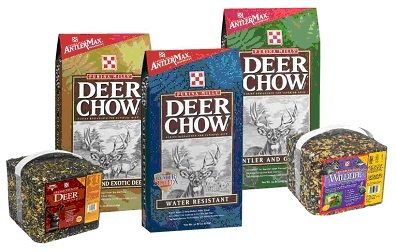 Purina Mills® Deer Chow® diets are regionally formulated to adjust for the mineral variations in plants and soil so they meet the specific needs of deer and elk in every region of the country.